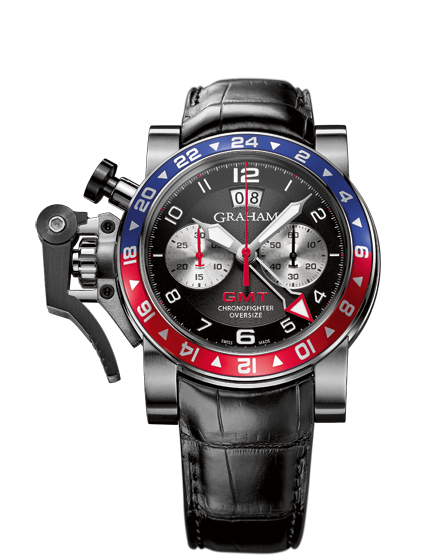 Graham released a new Chronofighter GMT Steel style, this one with a Pepsi style bezel a la Rolex GMT of the 90’s. I do like the somewhat more subtle sensibilities of this new Chronofighter and the oeverall direction the company has taken with its design. 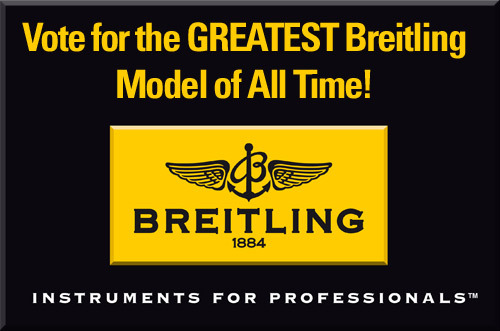 What’s the Greatest Breitling of All Time? What is your favourite Breitling of all time? We have selected 64 candidates, and now there is a battle down to the bitter end. 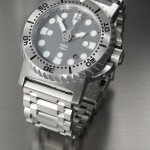 See this post for more details and to vote on BreitlingSource.com forums. You will need join the forum account to vote if you aren’t already registered. Its free! 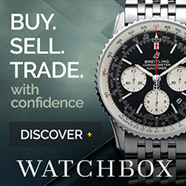 Associated with Breitling for the eighth consecutive year, the “star pilot” appears in a new advertising campaign in the company of the famous Navitimer. 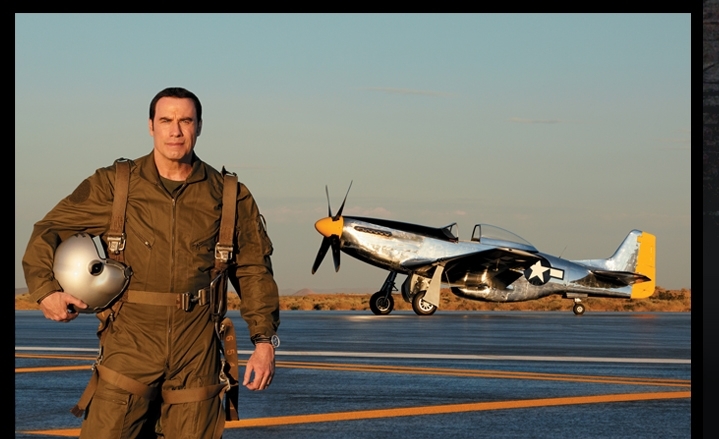 From his earliest childhood, John Travolta has always had two dreams: to fly every day and to wear a Navitimer – the cult model among aviation enthusiasts and professionals. An experienced pilot with over 6,000 flight hours to his credit and certified on eight types of aircraft, he remains more loyal than ever to the “official supplier to world aviation”, with which he shares the same spirit and the same constant quest for performance. In 2012, he stars in the brand-new advert dedicated to the brand with the winged B. The extremely evocative visual shows Travolta standing next to a Mustang P-51; a shot taken by French photographer Frédéric Imbert, on the runway of the Air & Space Port in Mojave, California. The pilot appears wearing the Navitimer with its famous aviation slide rule and its Manufacture Breitling Caliber 01, the world’s best selfwinding chronograph movement. 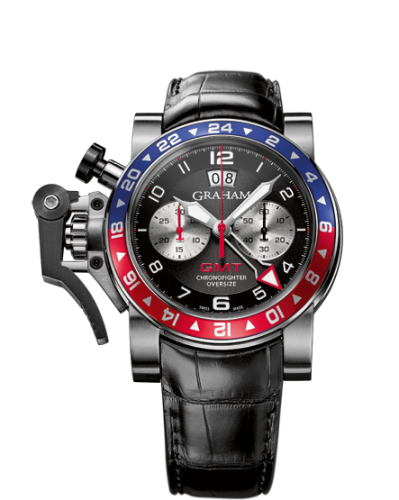 For John Travolta, it is quite simply the most legendary chronograph of them all. I must have owned over a dozen Pilot watches over the years, but this Glycine KMU 48 is only the second PVD pilot I’ve had. The first was a affordable Ticino Pilot watch which ultimately did not fit the bill for me. 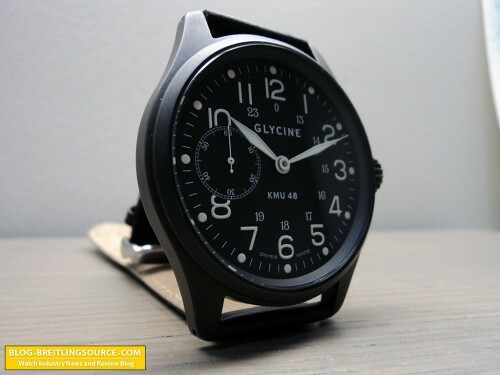 This Glycine comes closer, but in the end, I just don’t wear my pilot watches as much as I like to buy them. 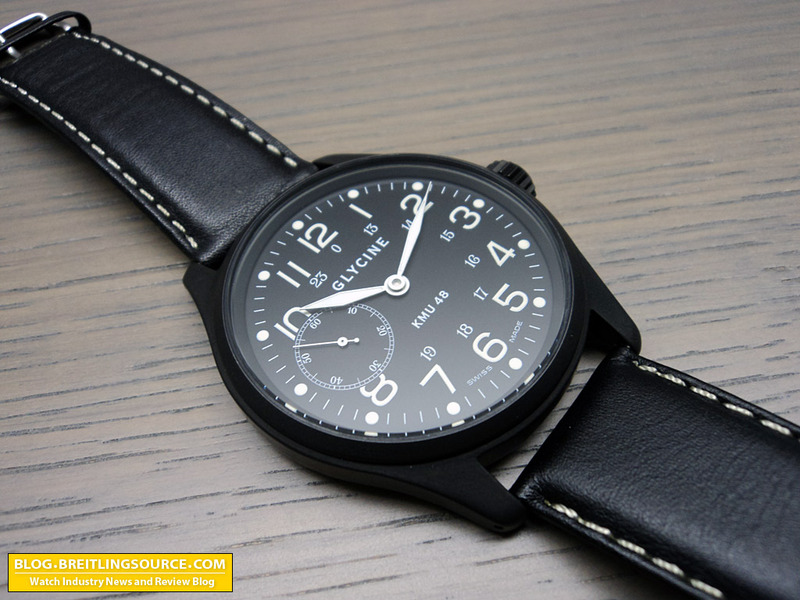 The Glycine KMU 48 is a LARGE imposing, saucer-on-the-wrist kind of watch. 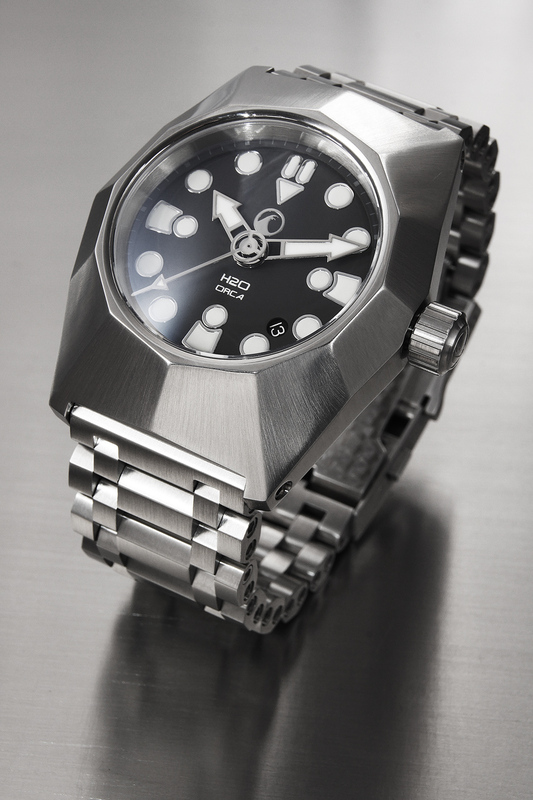 The 48mm diameter and healthy lugs made it simply too big for my wrist, which is the real reason that I never really ended up wearing this watch. 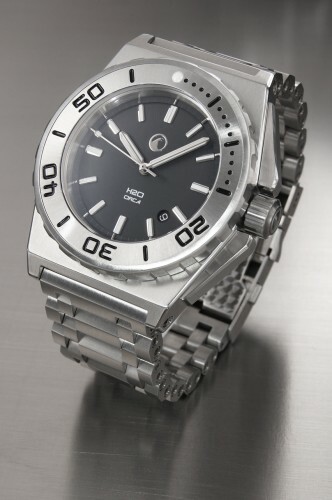 I picked it up in a multi-watch trade because it looked interesting to me, but ended up having to sell it. 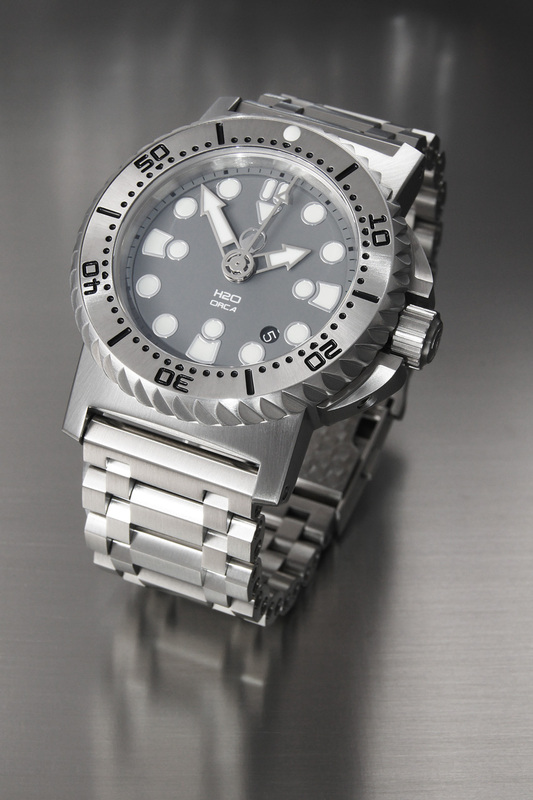 I think it would be better on a 7.5″+ wrist, and I generally wear large watches very comfortable like the Breitling for Bentley Motors watches. 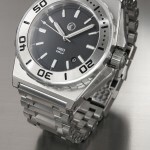 The watch has a simplistic appeal to it, like many Glycines do. It is also one of those little know, but well know enough brands that many who do not like mainstream brands often gravitate to. And for those reasons, Glycine has become a popular cult brand for Swiss Watch afficionados. The watch wears quite thin, especially for its radial diameter, and features 24mm lugs, which allows it to wear Panerai straps of which I have many. 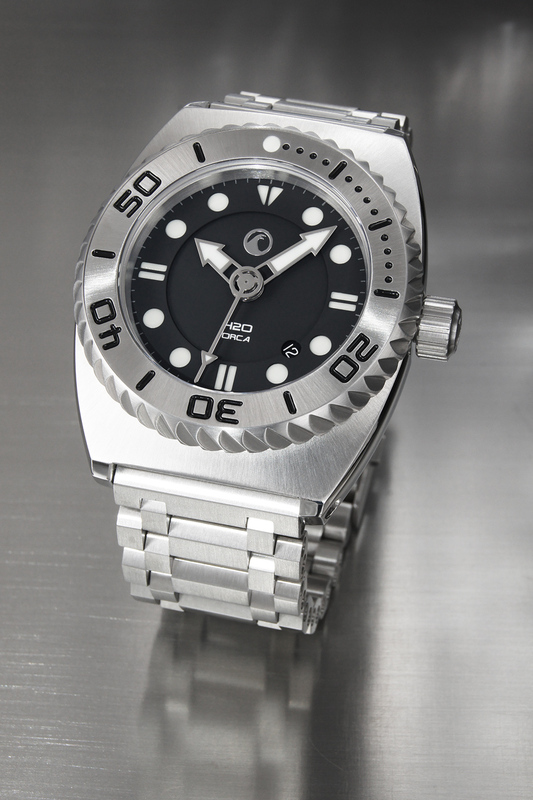 The lume is limited and is only present on the little dots around the dial and on the hands. 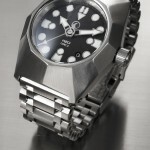 The PVD coating is done pretty well, and the lugs have holes drilled on the outside. 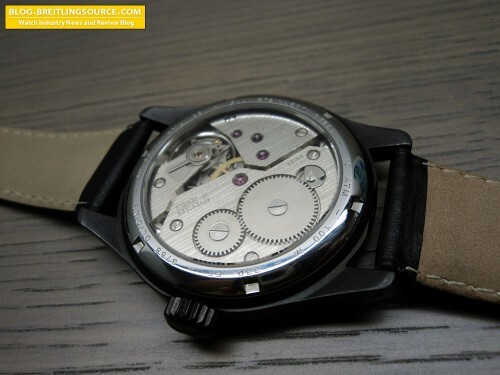 The movement featured in this watch is the ETA Unitas 6497. It only has one decoration, which is a laser etched “GLYCINE” on the bridge, it is so light its hard to see it in the photograph, but appears on the bridge that has the 3 visible jewels. The finish is pretty much basic raw “hammer-peened” bridges. For the price I paid for it, its a pretty cool piece, but I recently let it go to a fellow who appreciated it more than me. Hope you guys enjoyed the write up! 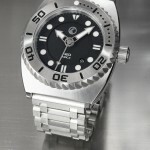 Germany Watch company H2O has press released their H2O Orca watch, and there are quite a few neat features. 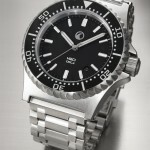 There are five different styles available, the Dive, Classic, Dress, Vintage and Mono. All share the same diameter and similar features, which is interesting since it essentially 5 different watches available here. 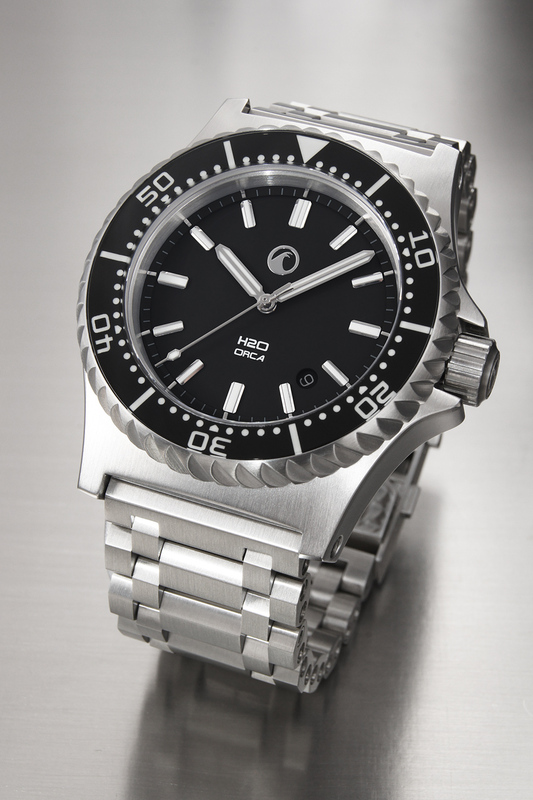 Read more about the H2O Orca Here.